Littlefinger speaking to Sansa, apparently telling her that people make their own justice, and she can avenge “them” (her family, presumably). 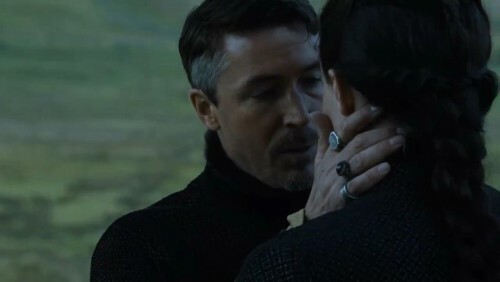 Combined with her traveling and the way the background looks (plus another piece of evidence discussed later), it seems probable that Sansa is going North to Winterfell… to marry Ramsay Bolton, perhaps, taking the place of the fake “Arya Stark” the Lannisters send to the Boltons? Although it then seems likely she’s either being presented to the Boltons as Alayne… or, perhaps more shocking, as Sansa Stark. This would be a radical compression of two storylines, and certainly suggests Harry the Heir has gone out the window.